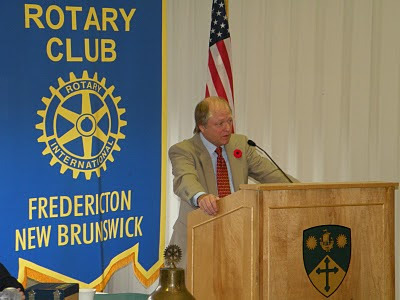 Don Chapman speaks to Fredericton Rotary Club members at the St. Thomas University meeting room, November 8, 2010, Fredericton, NB. Exactly 62 years ago today, the United Nations adopted its Universal Declaration of Human Rights -- dubbed by Eleanor Roosevelt to be the "International magna carta of all mankind." The principal author was none other than Canadian human rights activist John Peters Humphrey. It was one of Canada's proudest moments, from one of its finest citizens. In a sense, it helped define Canada to the rest of the world as a country which not just respected human rights, but advocated for them. Here's the Preamble: "Recognition of the inherent dignity and of the equal and inalienable rights of all members of the human family." No one could have written it better. Fast forward 60 years, when on Aug. 10, 2008, Parliament gave the go-ahead for our newest national museum -- the Canadian Museum for Human Rights. Opening next year, the purpose is to explore human rights, with special reference to Canada, to enhance the public's understanding of human rights, to promote respect for others, and to encourage reflection and dialogue. It was the image, if you will, of what Canada is supposed to be. Unlike other museums where visitors are simply viewers, the Canadian Museum for Human Rights engages you to think and be influenced. Its challenge? To ponder the thought, if you had witnessed human rights atrocities as they happened, would you be silent? Would you speak out? What side would you be on? Founder Izzy Asper said, "If you don't guard against (abuse) by stomping on abuse every time you see it, if you don't know about it, then you don't know enough to fight it." The theme was not just to educate, but to make Canada a truly "just" society -- a global example with enlightened leadership in human rights. All remarkably worthwhile goals. But if we as Canadians are to be the shining example to the world, then let's remember that actions speak louder than words. Regrettably, Canada's actions 62 years after John Humphrey's Universal Declaration of Human Rights clearly prove we haven't yet achieved "enlightened leadership." In September, 2007 Canada was featured as an "offending country" as reported by the UN Human Rights Commission magazine, Refugees. Entitled, The Excluded: The Strange, Hidden World of the Stateless, Canada encompassed a two-page spread about the Lost Canadians. Vancouver Observer magazine won a prestigious journalism award for last summer's investigative reporting on the issue, yet amazingly they seem to be one of just a handful in the Canadian media willing to speak out and educate the public. Today, Stephen Harper's government is violating two Supreme Court decisions, three UN conventions on human rights, and our Charter. Not only are most Canadians unaware, but they often don't seem to care. Protecting their people is the government job. Bad things happen when they turn against their own -- history's littered with examples. So when Harper's government justifies stripping away one's citizenship because they were born out of wedlock, or maybe because they were born in wedlock, because they were born prior to 1947, because of gender (women are still being discriminated against), babies being born to Canadian parents who are stateless, and people who have lived and worked in Canada all their lives now having their pensions questioned, something is terribly wrong. What kind of country has Canada become? For you the reader, will you speak out or be silent? Which side are you on? Canadian social justice activist June Callwood said, "once you know about the human rights abuse, you become a part of it." Combine that with Dr. Martin Luther King's statement, "history will record the greatest tragedy of this period of social transition was not the strident clamour of the bad people, but the appalling silence of the good." Check out www.lostcanadian.com.Become enlightened. Don't allow Prime Minister Harper to stomp on anyone's human rights. Equal should be just that. John Humphrey and June Callwood would have had it no other way, and neither should you. Engage yourself, contact your MP, let them know that "every Canadian counts." When abuses are allowed to fester, Canada becomes just another hypocritical nation that simply speaks lovely words. To really change this world, others must witness our actions, and it all starts with you looking into the mirror. Exactly 62 years after the adoption of the Universal Declaration of Human Rights, much work remains. Are you listening Stephen Harper?